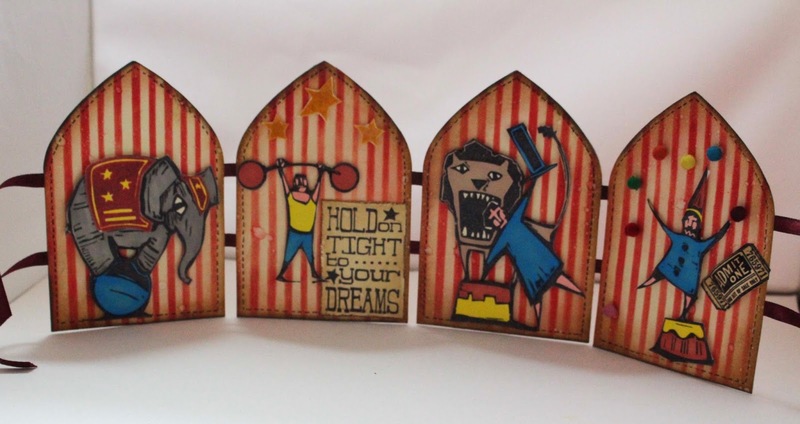 Eclectic Paperie: 'Life is a Circus'.........Well Some of the Time ! 'Life is a Circus'.........Well Some of the Time ! Hi everybody ! Toni here with a with a fun project for anyone that enjoys stamping, colouring and stencilling! 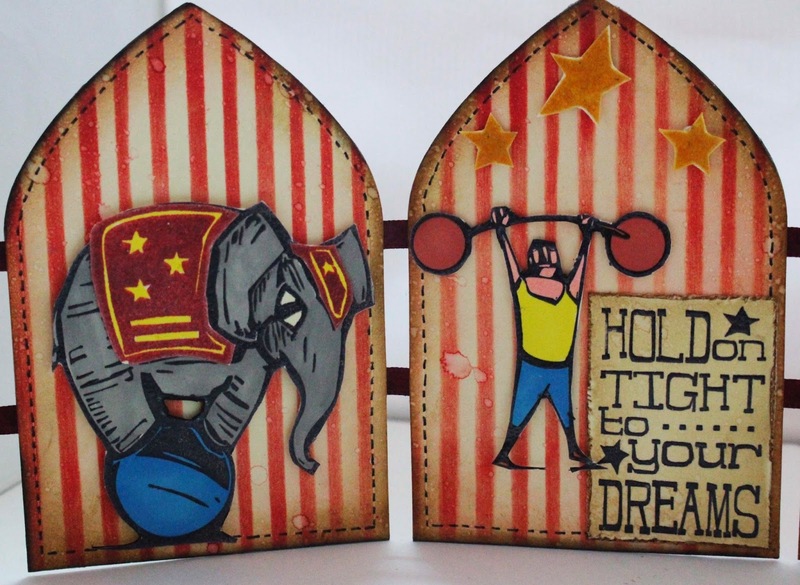 I've had great time playing with the new Stampers Anonymous, 'Big Top' stamps I received from Kim. So far I've made a birthday card for my son and this little fold out booklet. Initially, I wasn't sure about the stamps as they are quite a departure from what I usually like but I can tell you I absolutely love them ! the images are so playful and cute. 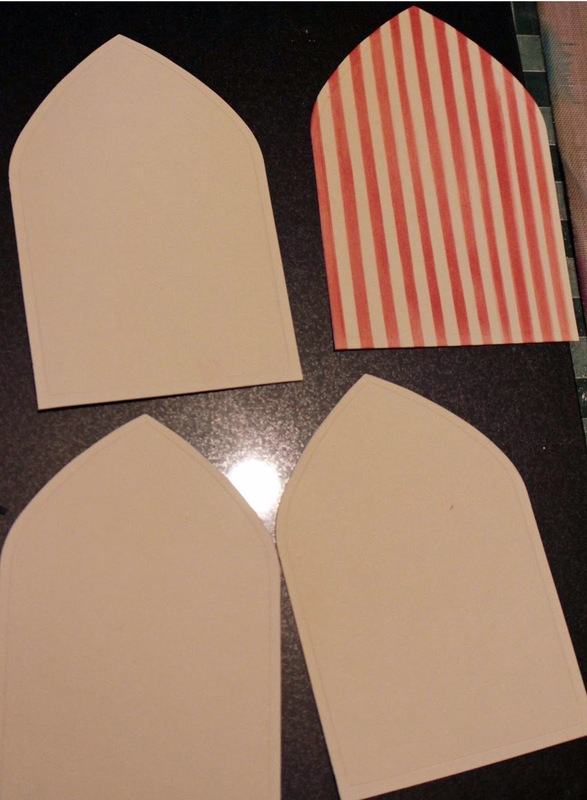 I started by die cutting four arches in manila card and four in Kraft card. I stenciled red stripes onto each of the manila arches using a home made stencil and Fired Brick Distress Ink. I blended some Gathered Twigs Distress Ink onto the edges and Antique Linen over the surface. I then did a bit of 'spritz and flick' and dried the arches with a heat gun. I stamped out the four circus images onto manila card with black Archival Ink and heat embossed them with clear embossing powder. I then coloured them with Pro Markers. I also stamped the elephant in red Archival Ink and cut out his 'blanket' and headdress and adhered these to the elephant I had coloured in. I then set to with a pair of sharp, fine blade scissors and cut out each of the circus acts. I added dimensional pads to the backs of each shape. This part was quite fiddlesome but worth it. I then adhered each shape to an arch. To enable the circus scene to stand up, I lined up the Kraft card arches and adhered two lengths of ribbon across the width, leaving a slight gap between each one. I then adhered the two sets of arches together. Here's the finished result. 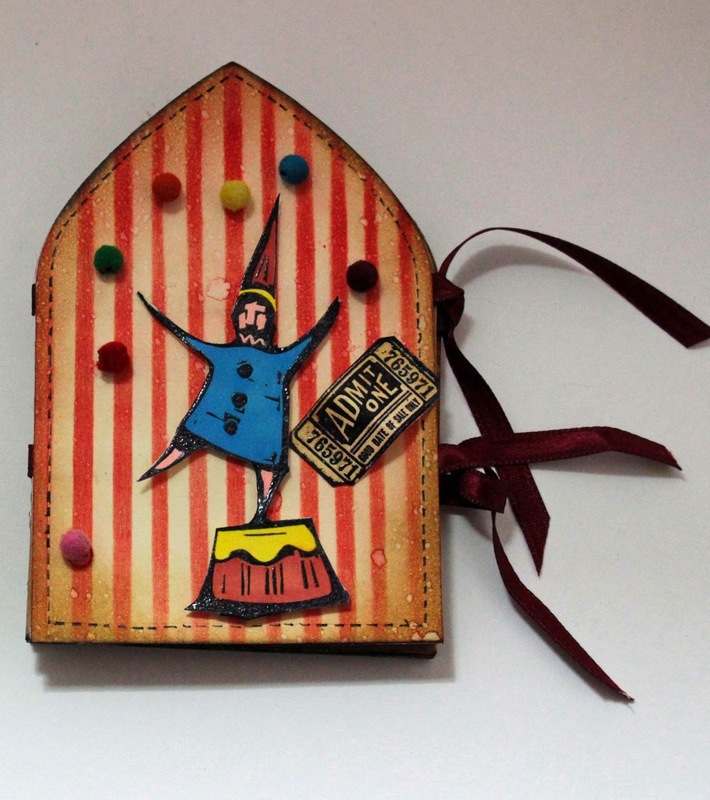 I added some little flock covered beads for the juggler, as well as a stamped 'admit one' ticket. I also used a fine black pen to create some faux stitching around each panel. If you fancy having a go at a project like this, you can pick up many of the supplies I've used from Kim's lovely eclectic Paperie shop. There is even a gorgeous Stripes Stencil by Wendy Vecchi, so you can put that craft knife away! Just click on the thumbnails below and you'll be transported right to the eclectic Paperie shop. Have just ordered these stamps some days ago and you used them perfectly! A gorgeous and whimsical make! I love it. Love how you colored the images. They really pop. Wonderful way to use them. What a FUN way to use those circus stamps! FAB fold out, Toni! LOVE the big top theme! 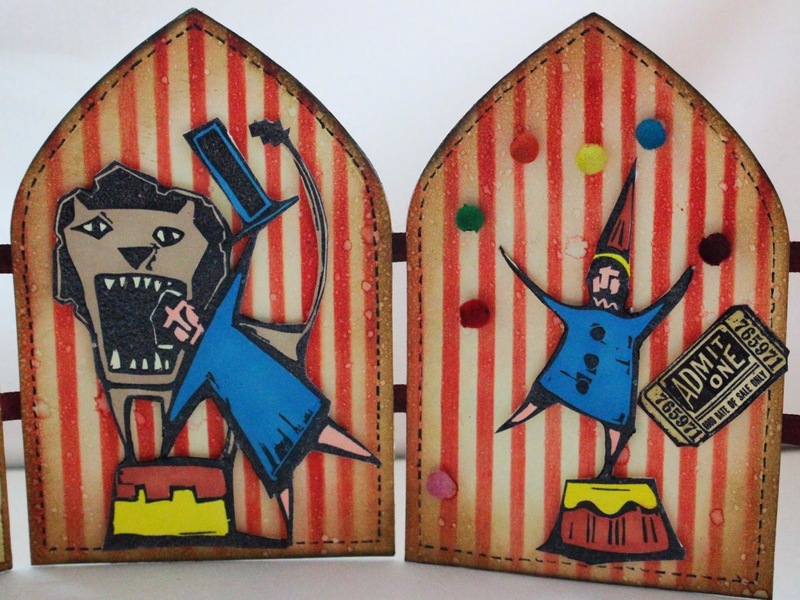 How fun is this little circus book!! love it Toni - the stripes and bright colors - this stamp set is really cute! What a cute project! 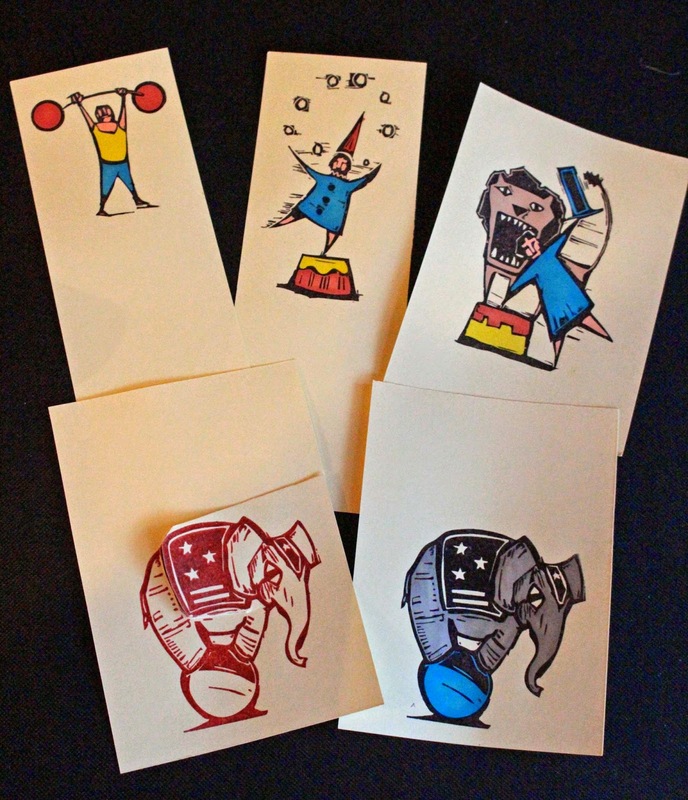 I love the striped paper with the circus images. Oh dear... This is so stinking cute !!! LOVE it !!! You are very talented and creativ !! Thank you for sharing this fab project !! You can really see how much fun you had with this - I love the quirky whimsical look! I know what you mean about having reservations about the stamps, but you've made them look very tempting, Toni! This looks like a reflection of my life! LOL! This is so adorable! I LOVE the whimsical feel of your project!!!! This is fantastic. I love the elephant. Recently went to the circus and sat front row in front of the elephants. This would be perfect for a layout! I just love how fun this is.